Scones are one of those breakfast items that are really just a dessert in disguise. That's not to say I don't love them - I just try not to kid myself into thinking I'm being healthy when I eat one. I chose these scones for my Project Pastry Queen choice this week because I knew that Joey would love them. He goes nuts for pretty much any dessert that's chocolate chip-based. Mine spread a bit while baking, but it wasn't really a problem. I stayed true to the recipe with the exception of the pecans - I omitted, as I usually do with nuts in desserts. I also brushed the tops with some melted butter before baking. I think a glaze would be extra decadent on these - I think a coffee or mocha glaze would be especially tasty! Next time I make these I think I'll make the scones smaller though - they were pretty massive when made as directed. As with most scones, these came together quite quickly, and were equally as low-maintenance. I only wish I had saved half of them to freeze and bake later - I have a feeling they would have been much appreciated come September when I have a newborn! Check out the Project Pastry Queen page to see how everyone else enjoyed the scones, and next week we're making more brownies! Preheat the oven to 350 degrees. Arrange the pecans in a single layer on a baking sheet and toast 7 to 9 minutes, or until golden brown and aromatic. Coarsely chop the pecans ad set aside. Process the flour, sugar, salt, and baking powder for 30 seconds in te bowl of a food processor fitted with a metal blade. Cut the butter into 1/2-inch cubes and add to the flour mixture. Pulse about 15 times, or until the mixture is crumbly. Stir the vanilla into the cream. With the food processor running, slowly pour 1 1/2 cups of the cream through the feed tube. Stop the food processor as soon as the cream has been added. If the dough has begun to stick together in a ball, remove it. If not, add more cream, 1 tablespoon at a time, and pulse until the dough begins to clump up and form a ball. Place the dough on a lightly floured flat surface and knead in the chocolate chips and pecans, handling the dough as little as possible. Form the dough into a 3/4-inch thick round and cut into 8 wedges. Place on an ungreased baking sheet, brush with melted butter, and bake 10-15 minutes, until the scones are a light golden brown. Serve warm or a room temperature. The scones are best the day they are made. Less than 5 miles from our house is a pick-your-own blueberry farm. Two years ago, I met up with a few friends and our kids for a morning of blueberry picking. I had visions of coming home with gallons and gallons of freshly picked berries - what would I possibly do with them all?? Instead, the berries were scarce, the sun was hot, and the kids were cranky. To say it was an utter failure would be a total understatement. To put it in perspective, we picked berries for almost 2 hours, and I paid 60 cents for my "bounty." We all agreed then and there that we'd never do that again. From then on, I vowed to do my berry picking at the the grocery store or farmer's market. But this year I decided to give it another go. Blueberries are Caroline's favorite fruit, and now that she's a bit older, I thought that she might enjoy picking her own berries. But this time I planned better. We set out quite a bit earlier, and since it had rained the night before, the weather was nice and cool. In probably 5 minutes, I had picked more berries than I did the entire time before. There were plenty down on Caroline's level, and she had her own bucket for collecting them. We picked and picked, and eventually Caroline got tired of it, because she dumped out her bucket and filled it up with leaves and twigs instead. Oh well. I ended up picking almost 2 pounds in just under an hour, which was plenty for some baking and snacking. To make the filling, combine the berries and the lemon juice in a medium saucepan. Cook over medium heat, stirring often, until the berries are soft and tender, 8-10 minutes. Add the sugar and cornstarch to the berries, and bring to a boil. Cook an additional 1-2 minutes, until thickened. Remove from heat and set aside. Preheat the oven to 350 degrees and grease a 9x13 inch baking dish. To a food processor, add all the ingredients for the crust and crumble topping. Pulse in 1-second intervals until the mixture resembles coarse crumbs. Reserve 1 1/2 cups for the topping, then press the rest of the mixture into the bottom of the prepared baking dish. Use a spoon to drop dollops of the berry filling over the crust, and use a spatula to spread the mixture over the entire surface. 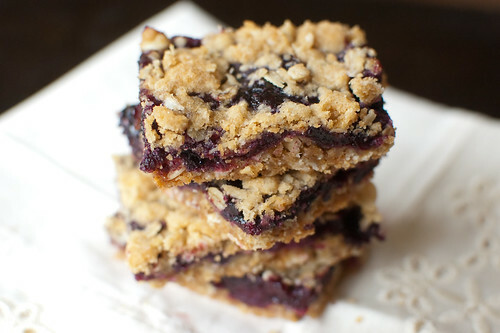 Use your fingers to squeeze together clumps of the remaining crumble topping, and sprinkle evenly over the berry filling. Bake until golden-brown, 30 to 35 minutes. 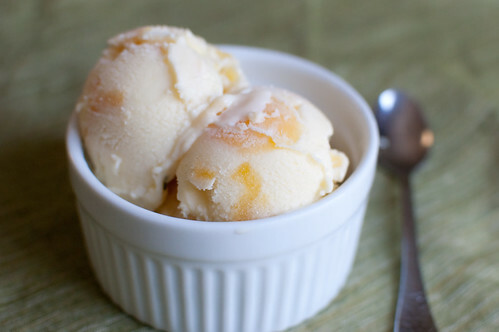 Cool completely before slicing and serving, or serve cobbler-style by scooping with a spoon. Ask and you shall receive! 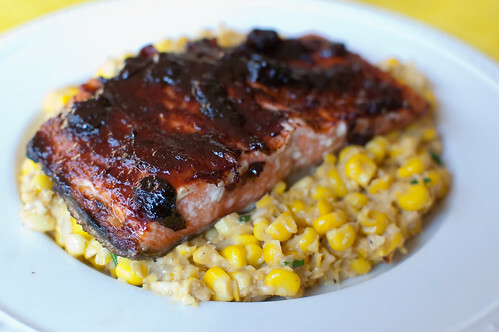 When I posted the Blueberry BBQ Salmon, I was asked by several people to also share the creamed corn recipe. So here it is! I've actually never been a huge fan of creamed corn. I think it's kind of soupy, fake tasting, and just not worth the calories. But I do like the idea behind it, so I set out to find a homemade version. I made and shared this recipe for Cheesy Creamed Corn with Cilantro and Queso Fresco a few years ago, but this time I wanted to find a more traditional version. For a side dish, this is fairly labor-intensive. The corn is first cut from the cobs, then the cobs are scraped clean of the pulp and "milk." The corn is sauteed with onion, then fortified with heavy cream, the pulp that you scraped off the kernels earlier, herbs, and sugar. I used my immersion blender to puree some of the corn, but you could also add a portion to a blender or food processor; or just leave well enough alone and serve it as is. 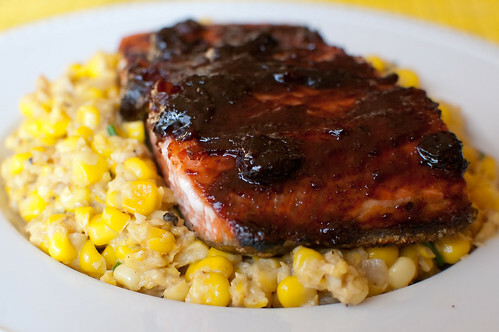 As much as we loved the blueberry bbq salmon, I think Joey liked this corn even more. It's a perfect way to take advantage of delicious sweet corn, and it's definitely fun to reinvent such a traditional dish. Cut the tip off of each cob of corn, and stand in a shallow bowl. Use a knife to remove the kernels by slicing downward. Over another bowl, use the back of a spoon scrape the kernels clean of the pulp. In a large skillet, melt 1 tablespoon of the butter. Add the onion and cook until just softened, 3-4 minutes. Add the corn kernels, pulp, and 3/4 cup water. Bring to a boil. Reduce the heat, cover, and simmer until the corn is tender, 10 to 15 minutes. Add the cream and sugar, and bring to a simmer. Cook until the cream has thickened, 4 to 6 minutes. 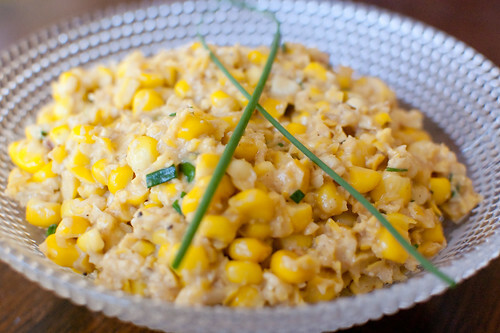 Use an immersion blender to puree part of the corn - just pick 5-6 spots in the pan to puree. Add the remaining tablespoon of butter, the chives, and the basil. Season with salt and pepper to taste, and serve. Joey and I discuss "nature vs. nurture" quite often when it comes to Caroline. 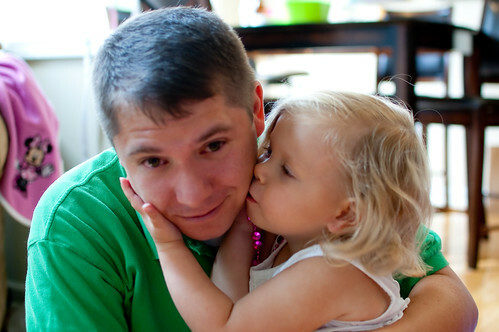 Is she inherently awesome, or is it a product of our awesome parenting? ;-) Though in all seriousness, she is a very good eater, and we discuss it at length. 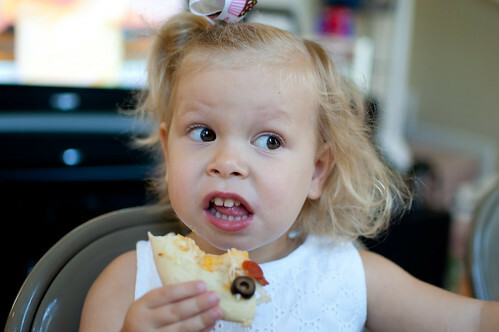 Is it because we are constantly introducing her to new foods, or is it just because she loves to eat? I guess we'll find out when our second child starts eating table foods, but for now I like to think that I at least had a little something to do with it. I'm quite sure that I'll screw her up in other areas of life, but at least I know I did something right - she does love to eat vegetables. We've been eating a lot of zucchini lately - baked zucchini fries, grilled or broiled zucchini, zucchini bread, zucchini on pizza... it has yet to get old. So far Caroline has enjoyed the grilled zucchini the most. She actually had a third helping yesterday! "Please more 'kini please!" 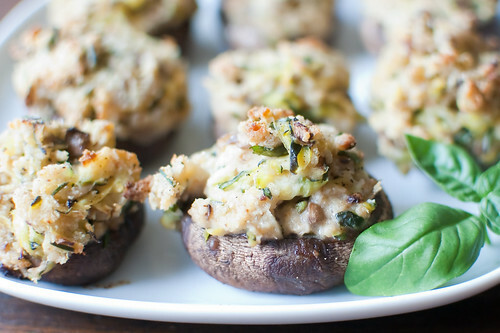 I was definitely intrigued when I found this recipe for zucchini and shrimp stuffed mushrooms, because I loved the idea of stuffing mushrooms with more veggies. I loved the lighter take on them, but I had my own inspiration for the filling. I love the combination of zucchini and goat cheese, so I ran with that instead. 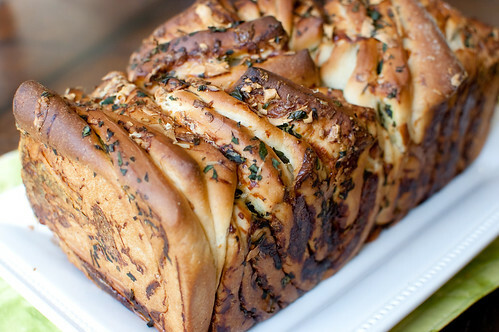 It's a very simple filling, amped up with the addition of garlic, herbs, and cheese. As expected, Caroline ate her fair share. 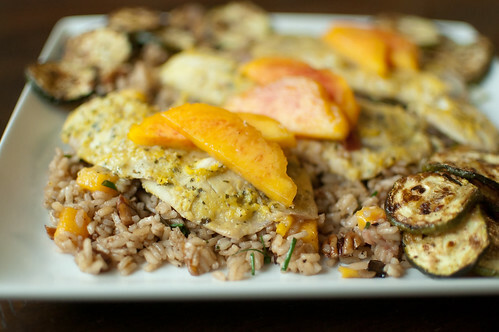 And of course I loved them too: but then again you could stuff pretty much anything with goat cheese and I'm happy! Finely chop the mushroom stems. Toss the zucchini in a colander with a little salt and allow to drain 5-10 minutes, then wrap in a paper towel and squeeze to remove excess moisture. Heat the oil in a small skillet over medium heat. Add the shallot, mushroom stems, and zucchini, and saute until the vegetables have softened, 3-4 minutes. Add the garlic and cook until fragrant, about 30 seconds. 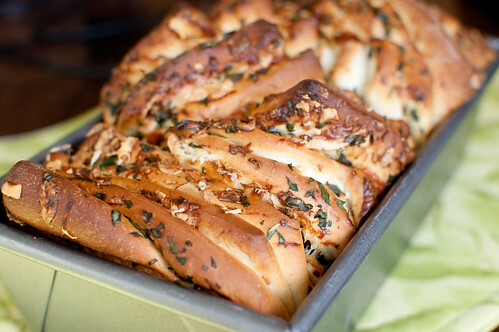 Remove the skillet from heat and stir in the cream cheese, goat cheese, Parmesan, bread crumbs, and herbs. Taste and season with salt and pepper. Scoop the filling into each of the mushroom caps. Drizzle with additional olive oil. 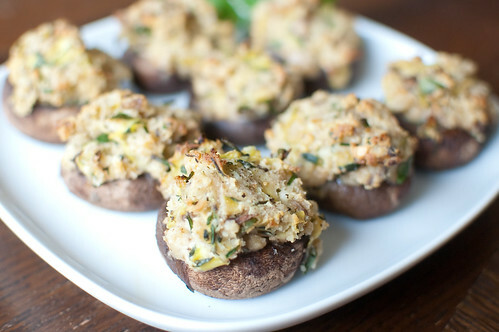 Bake 15-20 minutes, or until the tops are golden brown and the mushrooms are cooked through. Serve immediately. If I were forced to choose my favorite cookie (though please don't make me! 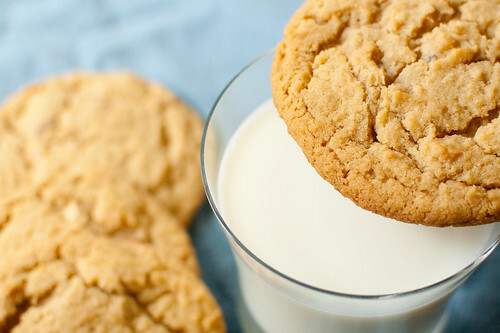 ), I would be hard-pressed to go with anything other than a classic peanut butter cookie. I, like so many others, just love peanut butter - I love it straight from the jar by the spoonful, on toast, with jelly for a sandwich, mixed with chocolate in pretty much anything... I even love it in savory applications - peanut sauce, anyone? And I'm happy to report that I've passed that love on to my daughter. Her lunches pretty much rotate between peanut butter and jelly sandwiches, peanut butter on crackers, and peanut butter bananas. Just last week, we stopped at Starbucks on our way to church. I leaned over Joey to order my (decaf) iced coffee, then Joey ordered his coffee. And from the backseat we hear "Please, peanut butter jelly, please!" Smart Caroline, wanted to place her order, too! This week was Wildcard Week for Project Pastry Queen, which means we can go back and make a recipe that we've missed along the way. I don't know why I didn't make these the first time around - I'm guessing maybe I still had some lingering morning sickness or first trimester exhaustion? Either way, I'm glad I went back to make them this week! Actually, these are originally peanut butter and jelly cookies. And while I think that sounds wonderful, I just felt like being basic this week. So I just made some giant peanut butter cookies instead. 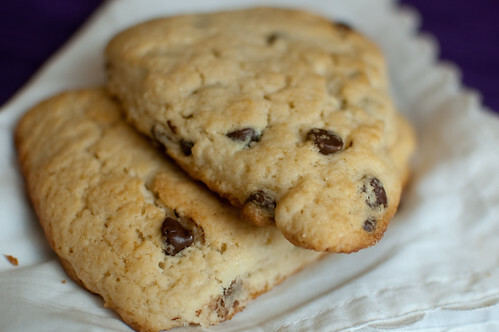 They are wonderfully soft and chewy, with just the right amount of crunchiness around the edges. And with honey-roasted peanuts mixed right into the dough, you get an extra dose of crunch. 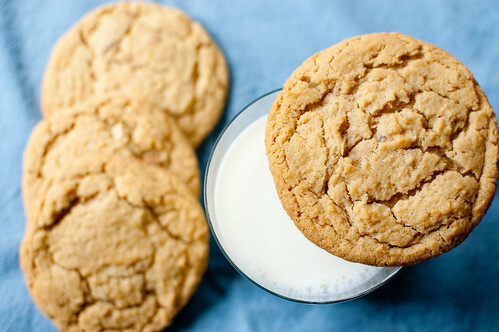 These are without a doubt the best peanut butter cookies I've ever made. They really are pretty much perfect - and enjoyed with a cold glass of milk, it doesn't get much better. Sarah of 20-something Cupcakes has the full recipe posted on her blog. Check out the Project Pastry Queen website to see what everyone else made this week, and next week we're making a giant, peachy cake - complete with Dulce de Leche! Oreo cheesecake holds a very special place in my heart. Our groom's cake at our wedding was not just cheesecake, but oreo cheesecake. And since I love reliving our wedding day, I'll share a picture. This is the Ramblin' Wreck, which is sort of a second mascot for Georgia Tech, behind Buzz. It is driven onto the field at the start of every home game. Not only did we have a replica of the Wreck for the groom's cake, but we also used the real thing as our getaway car from the reception. Driving through the streets of downtown Atlanta in the Wreck was one of the most fun experiences ever. Anyway, many of our guests still comment on the cake. 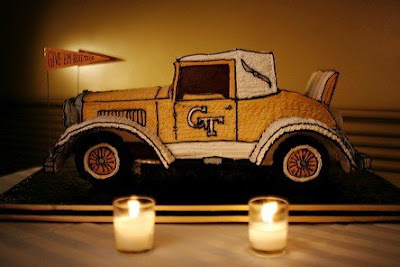 I have to admit that even though our wedding cake was drop-dead gorgeous, this cake definitely upstaged it. It was not only incredibly detailed and ornate, but come on - it was oreo cheesecake! And the entire cake was demolished within 10 minutes. I'm glad I got a bite of it when we cut into it, otherwise I would have been out of luck! So when I came across these cute little mini cheesecakes in Martha Stewart's Cupcakes, I knew that Joey would love them. And of course he did - and so has everyone else who tried them! I've actually made these cupcakes several times, though I'm just now getting around to sharing them on the blog. They are so so simple. 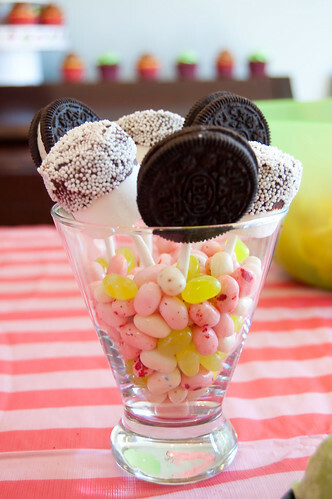 A whole oreo is used for the crust, so no crushing cookies, pressing crusts, prebaking, etc. And the filling comes together in less than 5 minutes. It is super simple, and only a few ingredients - cream cheese, cookies, sour cream (though I used Greek yogurt last time I made these with no problem), eggs, and vanilla. They do require a bit of preplanning, since they need to chill for a few hours before serving, but I'd say the hard part is actually waiting for them to chill before digging in! Since (obviously) I look back on our wedding day with fond memories, every time I make these cupcakes I'm reminded of not only of such a wonderful day, but also of our incredibly awesome cake! Preheat the oven to 275 degrees. 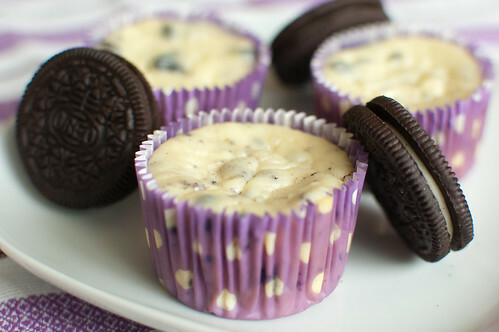 Line muffin tins with paper liners, and place 1 Oreo in the bottom of each cup. With an electric mixer on medium-high speed, beat the cream cheese until smooth, scraping down the sides of the bowl as needed. Gradually add the sugar, and beat until smooth. Beat in the vanilla, then drizzle in the eggs. When well combined, mix in the sour cream and salt. Stir in the chopped cookies by hand. Divide the batter evenly among the muffin tins, filling each one almost to the top. Bake, rotating tins halfway through, until the filling is just set, about 22 minutes. Transfer the tins to wire racks to cool completely, then refrigerate (in tins) at least 4 hours. Remove from tins just before serving. It's hard to beat a classic cheeseburger, but I love trying out new and different variations, nonetheless. I have had this particular recipe saved for about a year now, and I'm so glad I finally got around to trying it. This is from a Southern Living from last summer, and these fig-glazed burgers with red onion jam were also featured in the spread. So needless to say, I absolutely loved these burgers. 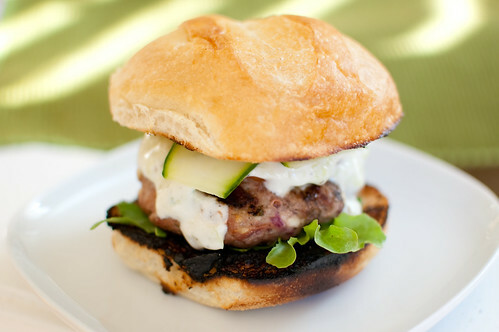 The salty feta + fresh herbs play wonderfully off of each other, and the bright freshness from the tzatziki is wonderfully light and refreshing next to the burger. Served on a toasted bun with some fresh cucumber, lettuce, and tomato, I was pretty much in heaven. I served these burgers with a watermelon, tomato, and feta salad, and it was a truly wonderful summer meal. And the leftovers made for a killer salad the next day for lunch! Mix together all the ingredients for the burgers. Using a light touch, form into 4 patties. Grease the grates of the grill and grill the burgers 5-7 minutes per side, until cooked through, turning once. 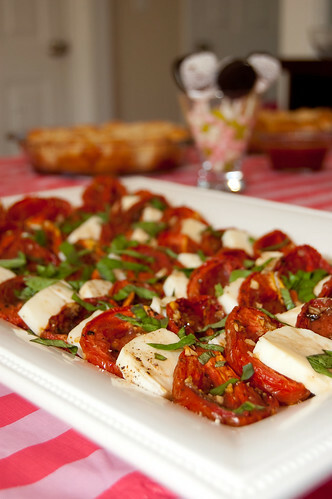 Serve with tzatziki, tomato, lettuce, and cucmber. Shred the cucumber on the large holes of a box grater, and using a few paper towels or a kitchen towel (one that doesn't give off lint), squeeze the cucumber to remove as much water as you can. Combine all the ingredients through the lemon juice in a medium bowl. Taste and season with salt and pepper. 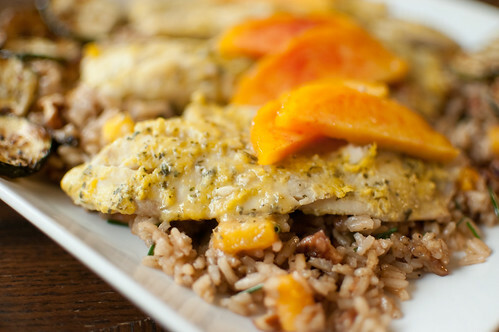 Top with a drizzle of olive oil, and refrigerate at least 30 minutes, to allow the flavors to meld. 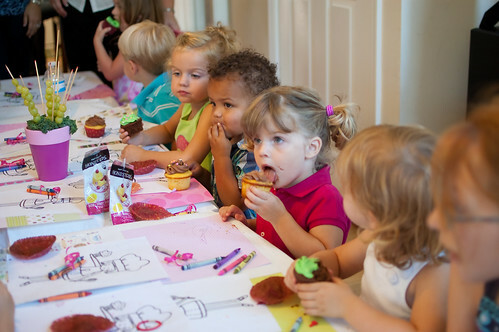 My sweet baby girl turned three years old last week (unbelievable), so we threw her a fun party to celebrate! As I've mentioned on here before, Caroline loves to help me in the kitchen. No matter what she's doing, if I ask her if she wants to help mommy, she drops everything and comes running. So it seemed fitting to throw her a "Little Chef" Party. 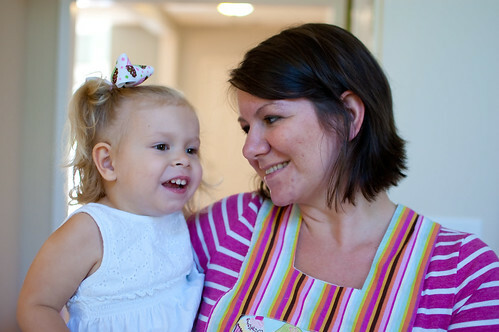 Her friends could make their own pizzas, decorate cupcakes, and design their own aprons. Everyone seemed to have a great time, and the party was a hit! I was so excited to find these invites from Tiny Prints - they were perfect. 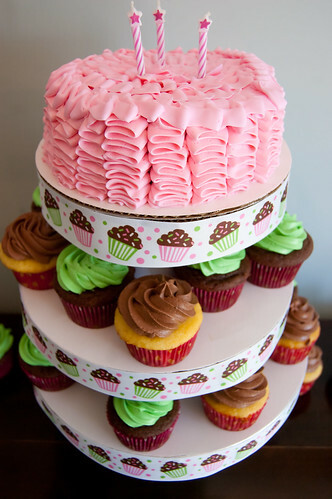 I loved the pink and green color scheme and the little girl holding the cupcake. I think they set the stage for a fun and festive party. 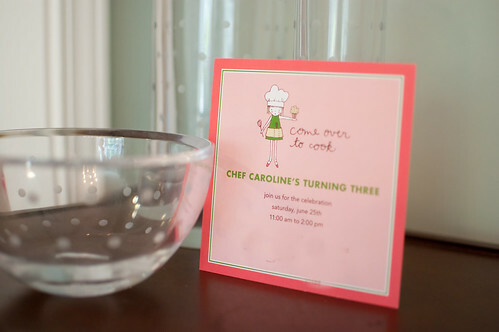 Of course I wanted to highlight some of my favorite pictures of Caroline over the past year, so to tie the banner into the theme I interspersed the photos with pink measuring cups. I also added some very simple arrangements of spoons and spatulas to the mantle. 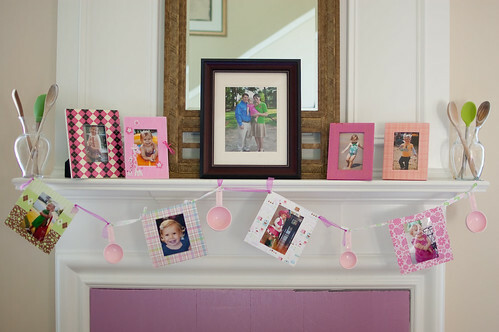 And since I have several pink frames, I used them to display a few more pictures. The kids' table was maybe my favorite part of the set-up. We created an extra-long table by lining up 2 picnic tables and Caroline's play table, and covered them all with butcher paper. I used pretty scrapbook paper as place mats, then Joey drew a replica of the little girl from the invite to give the kids something to color. 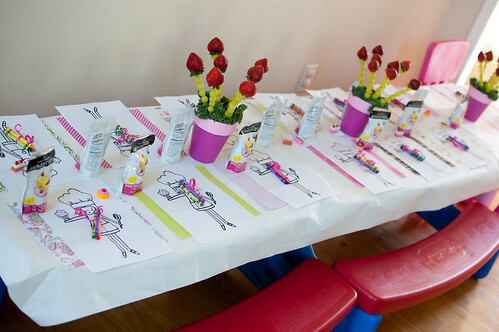 For the crayons, I just bought a big box of crayons and tied 3 together for each place setting with pink ribbon. 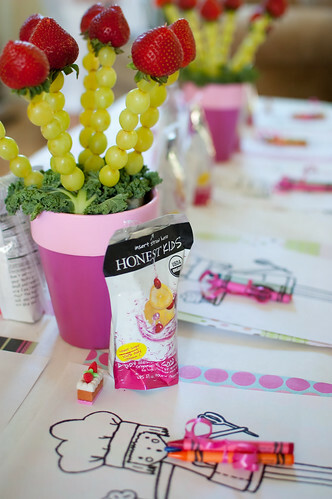 I also placed a juice box at each place setting, and scattered some cute dessert themed erasers along the length of the table. But perhaps the most popular aspect of the table were these edible centerpieces. I used grapes and strawberries to mimic flowers, and arranged the skewers in painted pots. I then used kale to cover the Styrofoam blocks that held the skewers. This gave the kids something to snack on while they waited for their pizzas to cook. 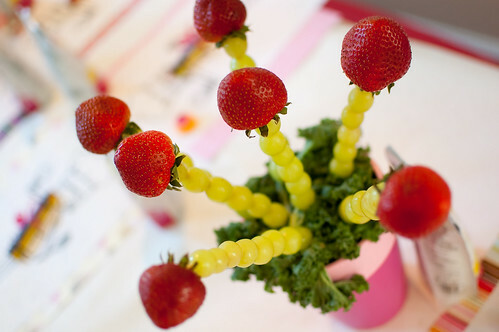 They loved pulling fruit off the skewers! And just to be safe, I cut off the pointy end from each skewer. 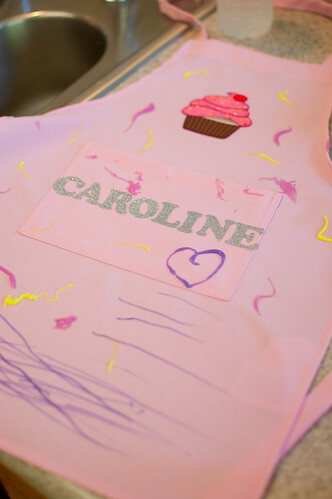 Another popular activity was decorating the aprons. 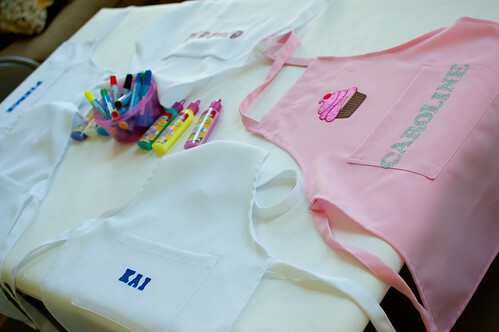 I ordered small kid-sized aprons from amazon, and ironed-on each name prior to the party. The girls' letters were pink and glittery, and the boys were blue. 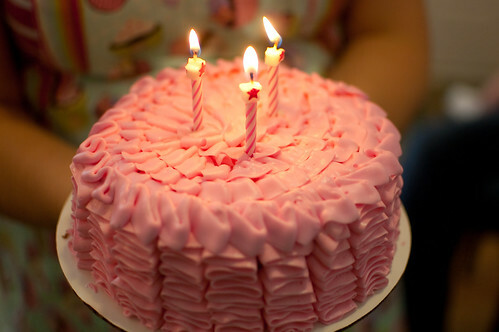 I ordered Caroline a pink one since she was the birthday girl :-). 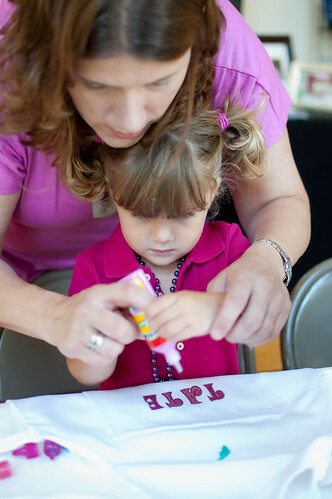 To decorate, they used fabric paint and fabric markers. Sadly, the paint took much longer to dry than anticipated, so they didn't get to wear their aprons for the party, but they made a fun activity and favor to take home, nonetheless. 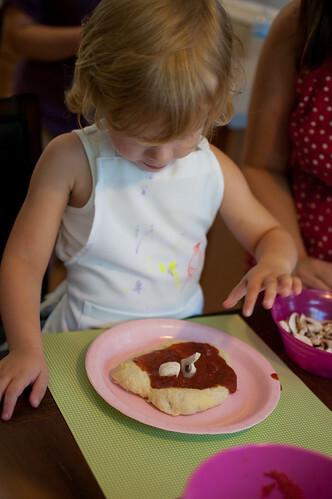 After they decorated their aprons, the kids made their own pizzas. I prepared and baked dough for personal-sized pizzas ahead of time, so the only cooking required was to heat the toppings and melt the cheese. 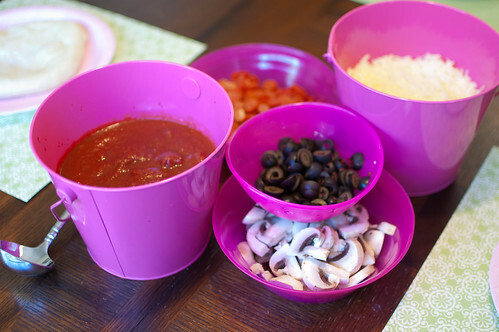 I kept the toppings simple, and just offered sauce, cheese, black olives, mushrooms, and pepperoni. 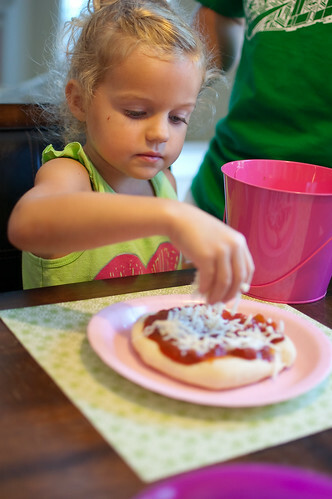 With parental supervision, each child personalized their own pizza. It was so fun to see what each child wanted on their pizza! 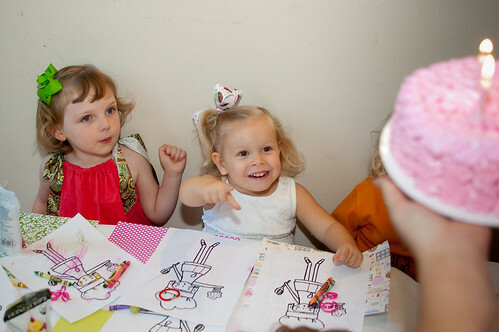 And it was even more fun to watch them enjoy their creations! For the food for the adults and parents, I kept things simple. 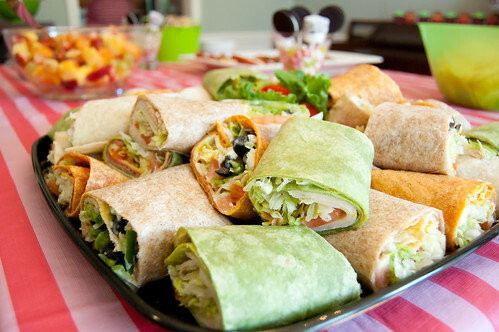 We ordered a big platter of various wraps from the deli - turkey with provolone, roast beef with cheddar, and veggie wraps with Pepperjack. I then cooked up a few simple sides to accompany them. 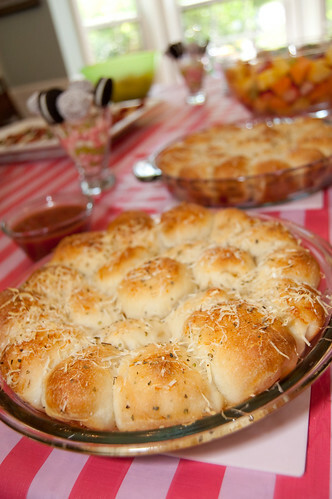 Pizza Bites with Marinara Sauce. We also served a simple fruit salad and some chips. 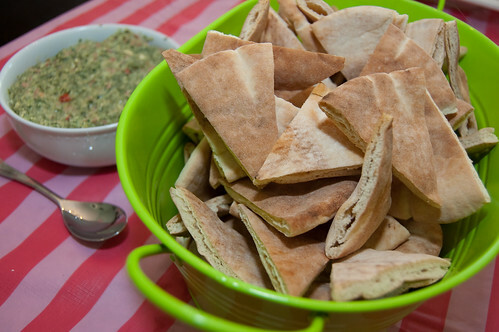 The pizza bites were definitely the hit of the party, with the spinach dip coming in a close second. One of the details I was (dorkily) really excited about was the colander. 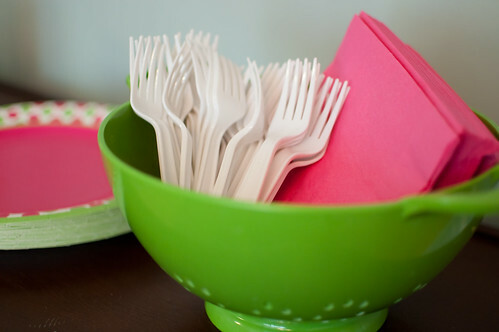 I used it to hold the napkins and forks, and I thought it looked so cute with the rest of the kitchen-themed decor. And finally, the center of every birthday party - the cake! I built a cupcake tower, and topped it with a 6-inch "smash cake" to give her a chance to blow out candles. Half the cupcakes were chocolate with vanilla buttercream, and the other half were yellow cake with chocolate frosting. They were all egg-free since Caroline is allergic, but to be honest I wasn't that thrilled with the taste. I normally find a vegan recipe to try, but this time I just used egg-replacer, and I felt like the cupcakes were all a bit dry. Luckily the kids didn't seem to mind though. 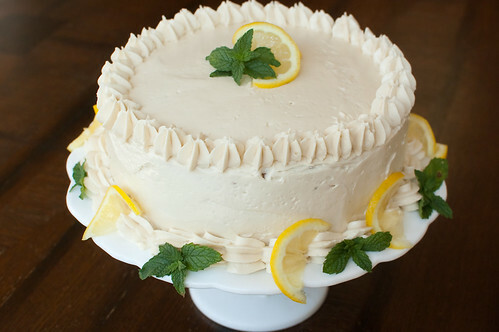 The ruffle cake was a big hit, and it was so easy it's almost funny. I literally spent less than 5 minutes decorating it, and it turned out so cute! 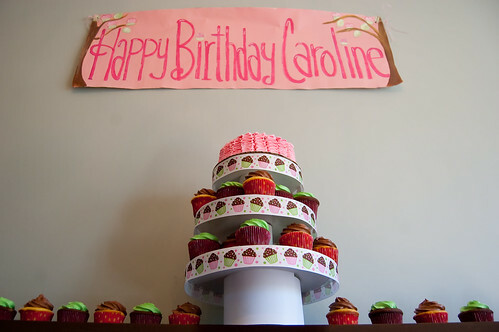 Caroline was really really excited for everyone to sing happy birthday, and she was even MORE excited for cake! 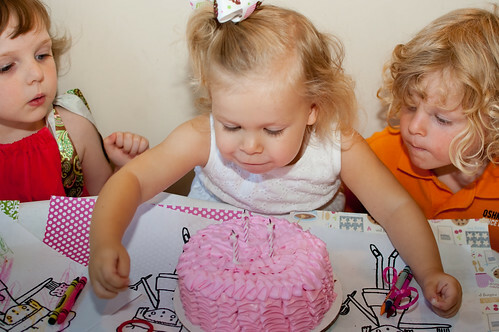 She especially loved blowing out the candles. 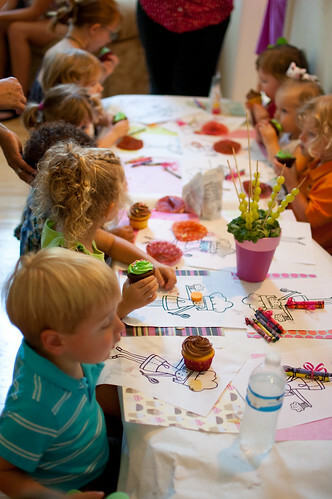 Since most of the kids in attendance were ages 2-4, I opted to keep the cupcake decorating simple and easy. I piped the frosting ahead of time, and had several different varieties of sprinkles for them to choose from to add to their cupcakes. 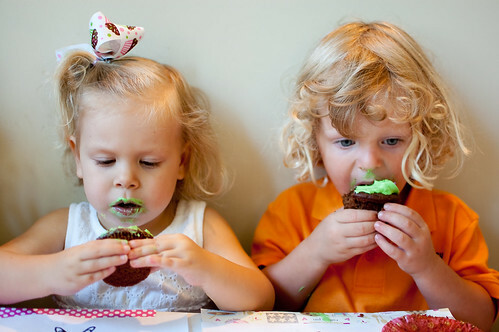 Lots of cupcake-eating going on! 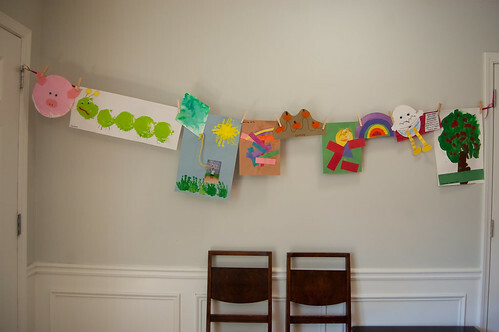 And finally, even though it's not really related to the theme and it's art that only a mother could love, I wanted to display some of Caroline's art projects for the party. I used a piece of ribbon and clothes pins to hang up some of my favorite pieces of her artwork from throughout the school year. Brownies are definitely one of the most popular desserts out there, but everyone has their own definition of the "perfect brownie." For me, I prefer a rich, chocolatey, dense and fudgy brownie over a cake-like one. 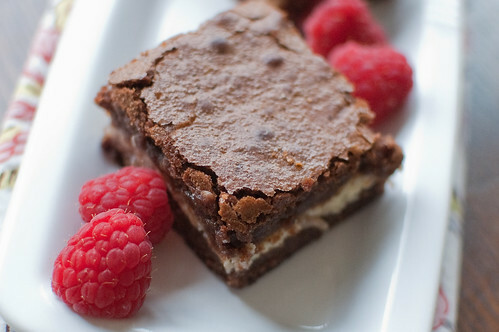 And while it's hard to beat a classic chocolate brownie, I still love trying out different flavors and variations. This particular version is one of my favorite combos - raspberry + cream cheese. The brownies get a double-dose of raspberry - jam is first mixed into the brownie batter, then more is swirled into the cream cheese layer. The brownie layer is just the way I like it - rich, dense, and super chocolatey. And the cream cheese/raspberry layer adds the right amount of sweetness without being cloyingly so. While these do have a few more steps than a typical brownie, nothing is terribly difficult or time-consuming. And after test-tasting a few - you know, for quality control purposes - I had to send the rest of the pan to work with Joey. I can usually handle baked goods in the house, but I was powerless to these brownies. I'm pretty sure you will be too. Preheat the oven to 350 degrees. Line an 8-inch square baking pan with foil. leaving the excess hanging over the edges. Grease foil. 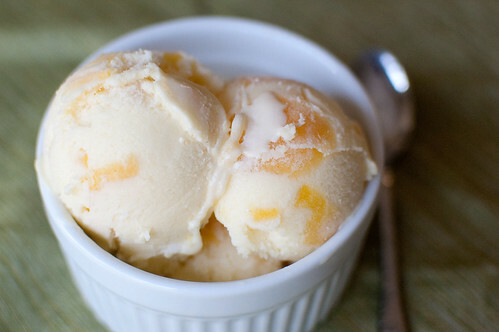 In the bowl of a food processor, combine the cream cheese, sugar, egg yolk, and vanilla. Set aside. Combine the flour, baking powder, and salt in a small bowl. Microwave the chocolate and butter in a large bowl, stirring after every 30 seconds, until melted and smooth. Whisk in 1/4 cup jam and allow the mixture to cool slightly. Add sugar, eggs, and vanilla to the chocolate mixture, and stir until combined. Whisk in flour mixture until just incorporated. Microwave the remaining 1/4 cup jam until warm, about 30 seconds, and stir until smooth. Scrape half the brownie batter into the prepared baking dish. 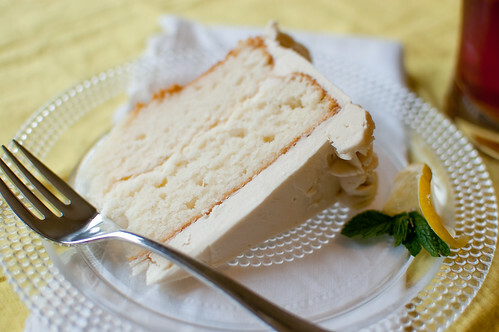 Dollop the cream cheese by the spoonful over the batter, and spread into an even layer. Drop spoonfuls of warm jam over the cream cheese, and use the tip of a knife to swirl jam through the filling. Spread the remaining batter evenly over the filling. Bake until a toothpick inserted into the center comes out with just a few dry crumbs attached, 50 to 60 minutes. Cool in the pan on a wire rack for at least 2 hours. Using the foil overhang, lift the brownies from the pan and cut into squares.